Depending on whom you ask, France is embroiled in its worst unrest in a decade or perhaps even 50 years. Its President Emmanuel Macron returned to the country from the G20 summit on Sunday to find Paris burning, and protests in several other cities to boot. Here's a ready reckoner on the ongoing turmoil that has lakhs of French citizens taking to the streets. Why is it called Yellow Vests movement? According to New York Times, the ongoing protests in France are an extraordinary venting of rage and resentment by ordinary working people, aimed at the mounting inequalities that have eroded their lives. The backlash erupted suddenly in November as a protest against Macron's fuel tax hikes to reduce emissions that are slated to kick-in from January. The protestors took to wearing the high-visibility fluorescent jackets that all motorists in France must carry in their vehicles, thus getting named the Yellow Vests protests. However, as the unrest gained steam over the past three weeks, other demands have been tacked on. The grassroots movement, which had little organisational support but was spurred along by social media, is now protesting broader economic reforms unleashed by Macron, which many voters feel favour the wealthy and big business. The reforms list reportedly includes sore points like pensions and unemployment insurance. 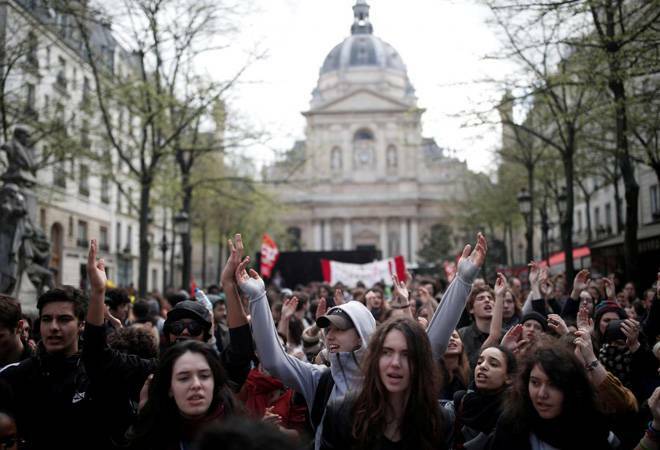 According to France's Interior Ministry, the protests this weekend drew 1,36,000 people nationwide, slightly down from the 1,66,000 who gathered last week. But the buzz is that the Yellow Vests movement has the support of three-quarters of the French public. However, a group of 10 representatives recently wrote an opinion piece in a local newspaper, calling for negotiations with the government. Among their demands are an "immediate and unconditional freeze in the tax increase on fuel" as well as the cancellation of new and more rigorous vehicle inspection rules, which raise costs for drivers, the US daily reported. They further asked to change the electoral system to one of proportional representation, which would benefit smaller parties, including those on the far left and far right. Yet other protestors are asking for the minimum wage to be hiked and for Macron to resign. Paris is not the only city left burning by the Yellow Vests - protests reportedly erupted in several towns and cities across the country, from Charleville Mezieres in the northeast to Marseille in the south. The unrest that had been building in intensity over the past three weeks, however, peaked on Saturday with rioters running amok in the capital. The protestors, many of them masked, torched over a 100 cars and at least 6 buildings, looted and damaged shops, and clashed with police that responded with stun grenades, tear gas and water cannons. The recently-inaugurated flagship Apple Store on the Champs Elysees found its windows smashed, as did the luxury boutiques of Chanel and Dior. Banks, too, were vandalised and the protestors left behind anti-government graffiti. What does France plan to do to solve the crisis? Government spokesman Benjamin Griveaux on Sunday said that the Macron administration was considering imposing a state of emergency - last imposed after the 2015 terror attacks - and ruled out any change the course of its policies. On Friday, speaking at the sidelines of the G20 summit in Argentina, Macron said he understood the "legitimate anger, impatience and suffering of people who wanted to live better" and reportedly requested time to look into how to push the low-emission agenda without penalising the poor. "It will fall on me to take additional steps in the weeks and months to come, but they will never be a step backwards," the 40-year-old former investment banker-turned-president clarified. Nonetheless, he ordered Prime Minister Edouard Philippe to meet with representatives of the "Yellow Vests" protest movement as well as Opposition party leaders, starting today. Hopefully, these talks will be more successful than Environment Minister Francois de Rugy's attempts last week.